One of our favorite things to do is collaborate with high end, stellar wedding vendors to create a dream styled wedding. We are free to let our imagination take full effect and come up with really cool designs that are out of the ordinary. Please feel free to take a look at some of our recent styled shoots! The ingenious photographer Nadege Richards of Vellum & Wing Photography tells stories through her photography. What story do these photos tell for you? We used bold red roses white spider mums, gold painted kale, weeping amaranthus, silver dollar eucalyptus, red tulips, dried oak leaves and European weeping beech as the large greenery. Vicki Moyer of Garnet Dahlia had a vision of a Halloween photo shoot that was dark, moody, and mystical. 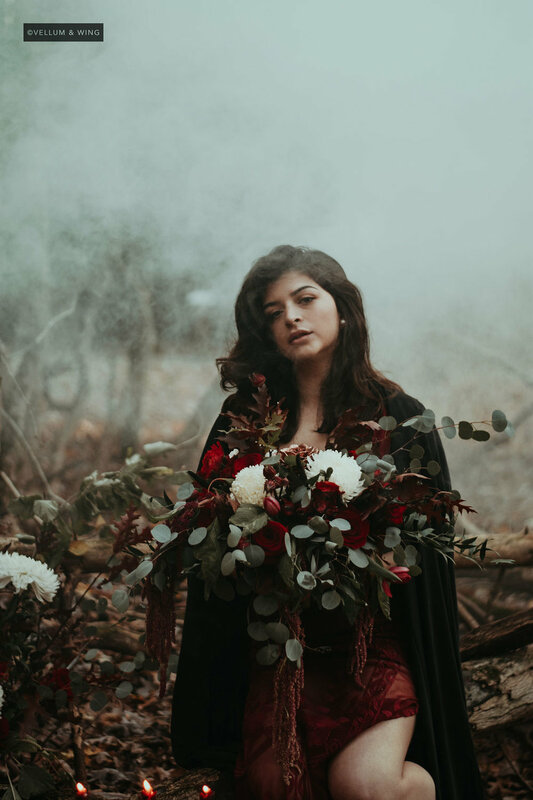 The fabulous and spooky team of vendors brought it together to create a stunning and ethereal October photo shoot. Some of the flowers we used were red gerberas, burnt orange banksia, pomegranates, blackberries, black prince roses, purple oak leaves, quicksand roses, and pears.